– Once a month, we depart from our meet-up location in Eugene to explore the beautiful terrain around us. Each place offers unique opportunities for self-discovery and nature connection. 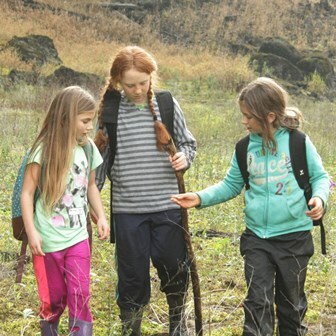 During our time together, we will learn about local flora and fauna and the ways various people of the past and present interact with the land. As we attune our bodies and minds to the lessons that surround us, we will learn to listen deeply to what is present in each precious moment. We integrate sense attunement practices with “bushcraft” (native botany, herbalism, bow drill, pit fire, basketry, and the like). Outings are a full day, 9am – 5pm and take place on a Saturday, approximately two weeks after the Wisdom Council. All trip locations are located between 30 and 90 minutes from Eugene. Transportation is provided throughout the school year, though we do ask for volunteer drivers for our end of the year camp. 2) Monthly Gathering & Wisdom Council – Council is an ancient communal practice of speaking and listening from the heart. The guidelines presented provide a sacred and safe space for exploring questions that lead the children to a deeper understanding of themselves and their place in the world. From 6-8pm one evening each month we will gather to discuss a different topic and whatever questions are most alive for us. The council itself lasts between 45 minutes to an hour. The rest of the evening includes some free-form social time and guided activities. Each participating family will host us for one gathering during the school year, for which an adult guardian of the hosting family is invited to join (typically Fathers with the boys, Mothers with the girls)*. Our first gathering, coinciding with the Autumn Equinox is a welcoming ceremony in which parents and siblings are encouraged to join. The last council of the year, all Mothers/Fathers come to share some of their own story and wisdom with the group. 3) Year End Rite of Passage Camp – At the end of each year, the Warriors of the Noble Heart join the Tenders of the Inner Tide to share with each other some of what they have learned. Each group undergoes a series of age-appropriate challenges to prove their readiness to take the next step on their path. They will also have an opportunity to demonstrate their maturity through service to their families, who are invited to join us for overnight camping and the closing ceremony to honor our children for their completion of the year. 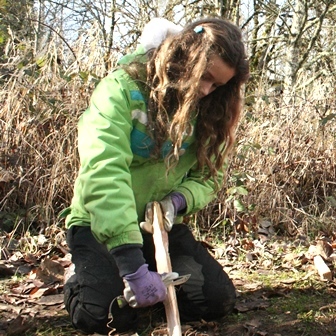 Boys and girls are responsible for clearing campsites, building, and tending a central fire, preparing food and cleaning up afterward. Year one is a five-day intensive with one overnight for which families are invited to join; year two includes two family overnights; and year three includes a participant-only, three night camping expedition. The first of three years is about orienting ourselves to our ecologically unique bio-region and exploring how it influences the development of our individuality. We will sharpen our senses through awareness games, contemplative activities, embodiment exercises, resilience skills and open exploration. All activities and discussions are designed to inspire introspection, as we traverse the edges of growth and strengthen the bond within the group. Through our explorations of old-growth forest, oak savanna, rivers and waterfalls, mountain peaks, and coastal ecosystems, we will have opportunities to test our endurance, strength, and agility of mind in a safe, supportive environment. While our time together promises to be an enjoyable and enriching experience, challenges will arise. It is through such challenges that we learn to overcome discomfort, explore our potential and the limitations of personal power, as we learn to better care for ourselves and those whom we hold most dear. We are blessed to live in a part of the world that has an abundance of individuals and communities dedicated to both innovative and ancient practices which steer our society toward a more harmonious relationship with the natural world. In year two we expand our awareness to include the culture of our family, friends, and neighbors, including those who grow our food and those teaching us how to cultivate a resilient and compassionate local economy. We will find inspiration in the stories and practices of the stewards of local biodynamic farms, permaculture education centers, cottage industries, homesteads, and intentional communities, where we will engage our bodies, dirty our hands and sharpen our minds as we help with natural building, food production, and tending the surrounding plant and animal communities. We will also explore practices that support the holistic health of these communities, including compassionate communication, song circles, and interactive theatre. change-makers, and travelers from across the globe, with special attention given to the representatives of indigenous wisdom. Participants will leave this year with a more profound realization of the universal interconnection of life. They will be further empowered with the courage, strength, and support of their community to live mindfully, in integrity with the values each of them holds most dear. *Please read full program description for additional elements. Far more than another extracurricular activity, coming-of-age mentorship and rites-of-passage are a crucial missing link in our society. A serious commitment and prioritization on behalf of everyone involved is necessary for the highest integrity of this journey. Priority will be given to families able to commit to the full three-year duration. A minimum commitment of one-year is required to apply. Starting in 2020, Nature’s Mystery will be offering this 3-year journey through community supported mentorship. We feel inspired to structure an alternative economic model funded by the contributions of our community to make mentorship, nature connection and rites of passage more accessible for youth/families. Applicants will be selected to participate and receive the financial support of their community by three criterion – application, interview, and commitment. If you would like to donate towards the cost of future participants, please visit our donor page. 1) Read the full journey description and agreements (link above). 2) Complete the Tenders Application, Parent and Participant Agreements and mail it in along to Nature’s Mystery P.O. box 741 Cottage Grove, OR, 97424. 3) Upon receiving and reviewing your application, we will schedule a time to interview the applicant and meet with your family.